GoalFriends - GF Global, LLC has appointed Jeanie Y. Chang, LMFT, CCTP as its new Chief Operating Officer. 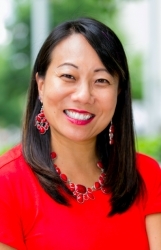 Goalfriends – GF Global, LLC announced the addition of Jeanie Chang, LMFT, CCTP as Chief Operating Officer. According to CEO and Founder Darlene Whitehurst, this new position is charged with strategically scaling the GoalFriends organization in pursuit of its goals of launching groups in all 50 states and 196 countries around the world. Chang has a diverse career background, beginning her career as a broadcast journalist in Washington, DC, having also worked in public relations, marketing, and client success in the corporate sector. She also followed a calling to get her license in marriage and family therapy and has treated patients in an integrated care model. Headquartered in Raleigh, NC with groups in 25 states and numerous countries around the world, GoalFriends is a monthly, step-by-step program that uses inspiration, goal setting, personal development, and group discussions to help women dream big and make their goals a reality. For more information, please visit www.goalfriends.com.